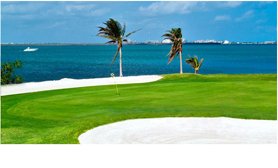 The Riviera Cancun Golf course is nestled in the heart of an ecological reserve. The natural landscape of wetlands serves as an ideal habitat for exotic flora and fauna. The opportunity to experience such natural beauty and wildlife is truly one of the privileges most coveted about this experience. 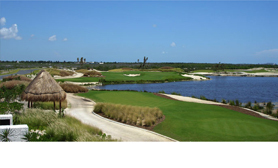 This amazing 18-hole golf course has ocean views and a Mexican-style clubhouse that’s surrounded by mangroves. Services include a full service golf shop, grill and snack bar, locker rooms and the Nicklaus Academy all conveniently located within the facility. The clubhouse is open from 6am – 7pm everyday. Riviera Cancun also provides a food & beverage service to players while on the course with mobile beverage carts. 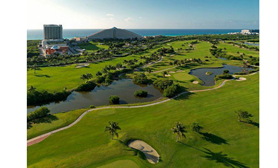 Puerto Cancun Golf was designed by Tom Weiskopf, this is an 18 hole, championship golf course in Puerto Cancun that stretches out over 185 acres and has ocean views and two holes that play on the marina. 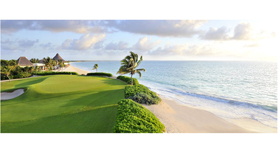 This golf course, located on the grounds of the Iberostar Cancún Beach Resort, is both enjoyable and challenging for golfers of any skill level, and is easily accessed on foot or via hotel-provided transportation. One hundred fifty acres of tropical paradise surround the 6,734 yard, par 72 course. The waters of the Nichupte Lagoon and its inlets border many of the holes, as do the Mayan Ruins of El Rey (circa 500 A.D.) along Hole 16. As you play, enjoy a vista of tropical vegetation and plentiful wildlife as varied as crocodiles sunning themselves, iguanas analyzing your game and colorful birds decorating the sky. This is Cancun’s main golf course. Its club has fine views of both sea and lagoon; its 18 holes were designed by Robert Trent Jones Jr. It also has two practice greens, three tennis courts, a pro shop, and a restaurant. 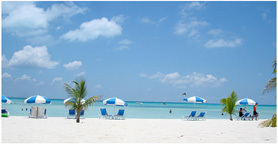 For more info, go to: www.cancungolfclub.com. You’ll find sophisticated French, Italian and Mexican cuisine at the beachfront resorts and low-key restaurants on Nichupte Lagoon. Nichupte is in fact a lagoon system extending over three thousand hectares and comprising seven bodies of water, including the Bojorquez Lagoon, the Mediterranean Laguneta and the Lagoon “of Love”, so called due to its heart-shaped formation. 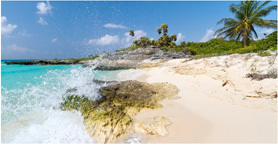 If that weren’t enough, the swamps also reduce the level of pollutants in the water, helping biodiversity and preserving the nearby reef formations of Isla Mujeres, Punta Cancun and Punta Nizuc. Choose from a variety of cuisines and romantic settings: perhaps Southeast Asian satay in a private palm-covered booth or Mexican peppers stuffed with fresh lobster in a Spanish-style courtyard. 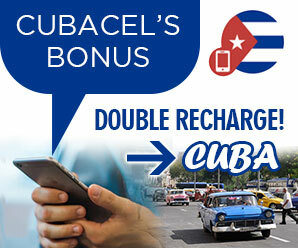 Nichupte also links up with the Caribbean Sea through two canals called Sigrido and Nizuc. Nichupte is also a place where you can practice other activities, such as recreational fishing and kayaking, and the more adventurous among you can gear yourself up for a spot of waterskiing.The lagoon’s main attraction is in its mangrove swamps, a natural area protected by the Mexican Gov. 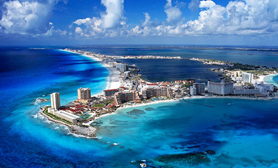 The Nichupte ecosystems are vitally important, since they protect the coastlines of Cancun from the erosion and wear that would otherwise result from storms and hurricanes. 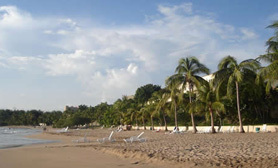 The calm surf and relaxing shallows of Playa Pez Volador make it an aquatic playground for families with young children. Marked by a huge Mexican flag at Km 5.5, the wide beach is popular with locals, as many tourists tend to head to the more active Playa Langosta. Sea grass occasionally washes ashore here, but by early morning it is cleared away by the staff of the neighboring Casa Maya Hotel. 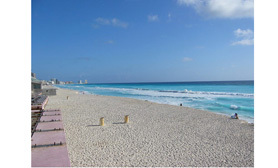 This is a seductive stretch of sand in the heart of the Zona Hotelera, accessible via a road next to Kukulcan Plaza shopping center. 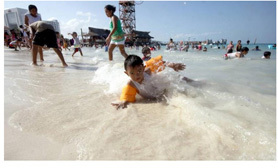 Despite its turquoise waters and silky sands, the waves are strong and the currents are dangerous. If this beach is crowded, you can walk in either direction to find quieter spots. There’s also a small tent where you can rent boogie boards, snorkel equipment, and motorized sports equipment. Although there are currently no public facilities, you can always walk over to Kukulcan Plaza if you need a restroom.